This property is directly associated with the early twentieth century developmental era (1920-1930) when a significant number of commercial buildings were constructed and the modern downtown commercial district was fully established. In 1923, Seattle adopted its first ordinance that regulated specific geographic areas for specified uses; it allowed the most densely concentrated commercial development to occur in the downtown core. The economic prosperity of the 1920s stimulated the development of numerous major highrise commercial buildings, as well as smaller-scale bank and commercial buildings, major hotels and apartment hotels, club buildings and entertainment facilities, which were typically designed by leading Seattle architects. During this era, the original residential district was entirely absorbed by commercial and other real estate development. By 1930, virtually all of the old residential properties - as well as many of the immediate post-fire era commercial buildings outside of Pioneer Square - had been demolished or removed. The concept of the modern hotel that would include private rooms, toilet and bathing facilities, public spaces and related guest services, originated in the early nineteenth century. By 1853, the settlement community of Seattle included its first hotel, the Felker House. By the later part of the nineteenth century, Seattle - like cities throughout the United States - included a significant number of hotels that served a wide variety of business travelers, tourists and both permanent and semi-permanent residents. By the late 1880s several elegant hotels as well as workingmen’s hotels were clustered along the west side of First Avenue between Cherry and Columbia – in proximity to the original railway passenger depot. Urban hotels, lodging and apartment buildings all closely resembled commercial office buildings in the 1880s and 1890s; it was not until the 1920s that hotel design became distinctly different in exterior appearance. Early hotel development was clearly stimulated by improvements in railroad service that brought immigrants and drew tourists and entrepreneurs. Prior to the fire of 1889, the Occidental – Seattle Hotel (1864, 1887 & 1889, destroyed), was the city’s premier tourist-oriented hotel, although there were numerous other hotels located within the commercial district. At least a dozen hotels were destroyed in the great fire of 1889; however, within four years some 63 hotels were in operation. After the fire, both the Rainier Hotel (1889, destroyed) between Columbia and Marion Streets above Fifth Avenue and the Rainier-Grand Hotel (c.1889, destroyed) at First Avenue and Marion Street functioned as the major tourist hotels. The Rainier had been intended initially to serve as a resort hotel, as was The Denny Hotel (1890-1892, destroyed). Both were large wood-frame buildings located above the commercial and residential districts with panoramic views out to the harbor. Other major post-fire tourist-oriented hotels included the Butler Hotel (1893, partly destroyed) and the Lincoln Hotel (1900, destroyed by fire in 1920) at Fourth Avenue and Madison Street. The Lincoln was promoted as an elegant residential hotel with family-style living quarters. 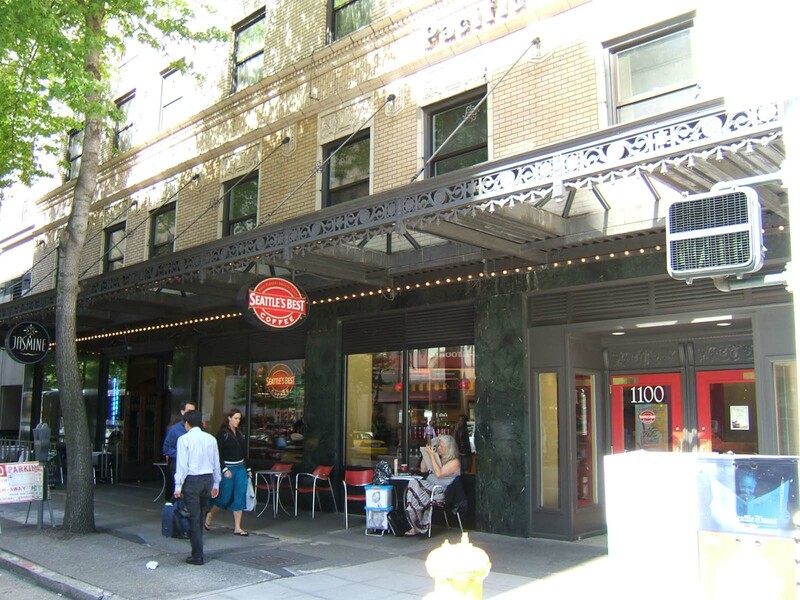 By the turn of the century, tourist and residential hotels lined the west side of First Avenue to Pike Street. Based on the number of hotels that were operating in Seattle by 1900, it is certain that they mostly catered to long-term residents rather than temporary visitors. Many buildings that were identified as hotels actually functioned as lodging houses or apartment hotels. During the late nineteenth and early twentieth centuries, hotel living was particularly common especially in the developing cities of the American West. Hotels varied significantly in size and accommodations provided and served every economic level from those of wealth to recent immigrants and transient salesmen and laborers. Given the tremendous population growth in Seattle after 1902, hotels and lodging houses played an important role in absorbing a new and largely transient populous. While large resort or tourist-oriented hotels like the Rainier-Grande Hotel and the Denny Hotel are noteworthy, the great majority of hotel buildings built after 1900 and prior to the 1920s were much more modest operations. A particularly significance boom in hotel development occurred between 1906 and 1910 in conjunction with local economic opportunities and population growth as well as the opening of the Alaska-Yukon-Pacific (AYP) Exposition of 1909 that drew some 3.7 million visitors. By 1910, Polk’s Directory included over 475 hotel listings. Family-style hotels were designed to include suites of rooms that would be used by individuals who needed especially comfortable long-term accommodations for their relocated families or those who traveled regularly but maintained a principal residence elsewhere. Apartment hotels differed from apartment living in that regular household help and meals were provided as part of the hotel services. During the 1920s, a second boom in major hotel development occurred at which time several luxury hotels and large apartment hotels were built in the downtown commercial district. They contrasted with earlier hotels that were rarely taller than six-stories; like their neighboring office buildings, these new hotels were significantly larger and taller multi-story buildings that accommodated hundreds of guest rooms. Several were designed to include kitchen facilities and promoted for both hotel and apartment hotel purposes, including: the Spring Apartment Hotel (Kennedy, Vintage Park, 1922); Claremont Apartment Hotel (Hotel Andre, 1925); and Camlin Apartment Hotel (1926). The construction of the highly luxurious Olympic Hotel at a pivotal central location in the Metropolitan Tract in 1923 appears to have spurred other major hotel construction nearby, including: the Spring Apartment Hotel (Kennedy, Vintage Park, 1922); Continental Hotel (Hotel Seattle, 1926) and the Hungerford Hotel (Pacific Plaza, 1928). Simultaneously, numerous hotels were developed nearer the new retail core at the north end of the commercial district, including: the Vance Hotel (1926); the Benjamin Franklin Hotel (1928, destroyed) and the Bergonian Hotel (Mayflower Park Hotel, 1927). The design for most – but not all – of these hotels included large lobbies, restaurants, meeting rooms, and storefront level retail spaces. They were typically executed in a modest neoclassical mode with brick cladding and distinctive terra cotta ornament at the base and building cap. The 17-story Roosevelt Hotel, designed in the distinctive Art Deco style was completed in 1930. It was the last major downtown hotel constructed during this era and the tallest to be built until the late 1960s. In 1969, the 13-story Benjamin-Franklin Hotel was interconnected to a new 40-story tower wing and renamed the Washington Plaza Hotel. In 1980, the Benjamin Franklin Hotel was demolished in order to construct a second (44-story) tower wing, now known as the Westin Hotel. The Hotel Hungerford was constructed in 1928 and replaced the old Hillcrest Hotel, which had been established in the former McNaught Mansion. The James J. McNaught Mansion (constructed c.1880) was relocated to this site in 1902 in order for the new Carnegie Library to be constructed on its original site. By 1927, the Hillcrest Hotel was considered a landmark as few old mansions remained in place downtown Seattle. The Hotel Hungerford was constructed after the Hillcrest Investment Company entered into a 99-year lease of property with Max Kreilsheimer and Earl Hungerford purchased the rights to construct a modern hotel building on the vacated site. By this time, Earl Hungerford had a 20- year long association with hotel enterprises in Washington State and the Pacific Coast. Hungerford came to Seattle in 1914 after having made money in timber industry. He owned and operated hotels in Grays Harbor, Portland and California and managed the Caledonian Hotel (destroyed) at Seventh Avenue and Union Street. He is reported to have toured Eastern hotels to obtain ideas about the design for the Hotel Hungerford, which was built A.D. Belanger & Co. at a cost of $500,000 according to architectural plans prepared by C. Frank Mahon. Hungerford promoted his modern ten-story hotel that featured 180 “outside” rooms as “a good place to live” with a “homelike appearance” and a focus on service, comfort and convenience. The original design was reported to include 20 apartment suites and 12 bachelor apartments, seven retail shops and two High speed elevators. The hotel was opened with a gala dance in the Spanish ballroom (not to be confused with the ballroom of the same name in the highly luxurious Olympic Hotel located a block away) on August 30, 1928. In 1928, hotel rates were $1.50 per day and up and $10.00 per week and up. The land remained in the ownership of the Kreilsheimer family until 1977 and the hotel continued to be owned and operated by the Hungerford family, as well. It was operated by Hungerford’s daughter, Grace Hungerford until 1970. Then it was operated by Earl Hungerford’s two granddaughters Mary Ann Whitaker, who at the age of 13 began working at hotel and eventually ran the dining facilities, and Betty Hallock who ran the hotel itself. In 1977, the Spring Development Company – part of Unico Properties, Inc. purchased the land parcel from the Kreilsheimer family the hotel from the descendants of Earl Hungerford. In 1978 the building and land was sold to the Fourth & Spring Associates (Pat Colee and Richard Clotfeller, partners), which undertook a major renovation of the hotel rooms reducing the number from 174 to 168. The project also included cleaning the brick and terra cotta exterior, replacing windows and upgrading the lobby. At that time the hotel was renamed the Pacific Plaza Hotel. The architect for the Hotel Hungerford was C. Frank Mahon; however, no biographical information has been gathered about him and virtually nothing is known about his career in Seattle or elsewhere. In 1927, his offices were located in the Orpheum Building. Despite some storefront level and lobby alterations this is a well- preserved example of an important downtown property type, tourist-oriented hotel. It is a noteworthy example of hotel design during this era and is associated with an influential hotel developer of the era. Located at the NE corner of the intersection of Fourth Avenue and Spring Street, this nine-story hotel building (with a concrete foundation/basement) originally housed several retail stores and 181 hotel rooms including 20 apartment suites. It has an irregular footprint measuring approximately 75’ x 111’ and continues to function as a hotel. It exhibits a three-part vertical block façade composition and the upper floors are lavishly decorated with classically-derived terra cotta ornament. The reinforced concrete structural system is primarily clad with yellow-cream color brick. The utilitarian shaft extends from the third to the eighth floor levels and is only accentuated by simple unframed rectangular window openings with terra cotta sills. By contrast the building is capped at the uppermost floor level by lavish glazed terra cotta ornament including elaborate window surrounds incorporating turned colonettes, garlanded lintels, and shell-form tympana. The roofline is terminated by a simple, narrow terra cotta cornice. Original 1/1 double-hung windows appear to have been replaced with an in-kind window product similar to the original. The two-story building base includes the storefront level at Fourth Avenue and the second floor/hotel lobby level accessed from Spring Street. The building base is capped by a simple classically detailed intermediate cornice and the second floor level windows include sculpted terra cotta lintels and a continuous sill. The entire Fourth Avenue storefront level is distinguished by an original ornate metal canopy that includes seven modern pyramidal skylights. The storefront level has been partially remodeled, although portions of the original storefronts remain in place including green marble cladding and wooden window and doorway trim. The original hotel canopy and terra cotta ornamented entryway at Spring Street have been extensively remodeled and the Fourth Avenue entryway eliminated. There do not appear to be any intact or architecturally significant interior building features, finishes or public spaces. 'Old Landmark will be Razed for New Hotel" Seattle Times, December 9, 1927. "Hungerford Open House" The Seattle Daily Times, August 30, 1928.